With This Ring – I Declare! Okay, whose hand do you see in this picture – Prince William’s fiancée Kate Middleton’s – or mine? (If you aren’t quite sure, the age spots, old-lady veins and nubby nails ought to give you a clue!) That’s right; you are looking at a photograph of my very own hand, and I’m wearing a ring that, while it may not be nearly the same in size and value as the famed "Diana sapphire”, is every bit its equal in terms of romance. So sit back, ladies, and prepare to get jealous because you’re about to hear the kind of story that fairy tales are made of. Once upon a time there was a young girl and a handsome lad who were in Vacation Bible School together way back when they were in kindergarten, but they didn’t fall in love until their freshman year in college. Although they were only nineteen at the time, they decided to get married (a fact which totally grosses their kids out, even today.) Being so young, they didn’t have any money, but it really didn’t matter because they had each other – plus a harvest gold crock pot they’d gotten for a wedding present. In due time children came along, which naturally sucked up any extra cash that might be lying around the house, not that there ever was any anyway. Don’t get me wrong, Marc had a great job and made enough money so that Lee Ann was able to stay home and raise the kids, but boy was it ever expensive! At first she did her best to hold down the cost by using cloth diapers (without the aid of a diaper service, mind you) and even making her own baby food from vegetables she grew in the garden. But by the time baby #2 came along, she gave all that up and just fed him Gerber’s out of a jar. Babyhood led to toddlerhood and then it was on to elementary school. Suddenly everyone wanted to be in scouts (and that meant uniforms, and summer camps, plus hundreds of boxes of cookies that Mom bought, to keep from having to peddle them door-to-door.) They also wanted to take piano lessons (which involved the purchase of a piano) and play sports (requiring more uniforms, and league sign-up fees, not to mention all those juice boxes!) Junior high brought on a demand for orthodontics and contact lenses, and new clothes that were outgrown in minutes, but that was nothing compared to high school. As if Homecoming dances and proms and church ski trips weren’t pricey enough, the kids developed a nasty habit of banging up car fenders, sending Dad’s insurance – and his blood pressure – through the roof! At last the day came when everybody got their hands out of Dad’s wallet, so to speak, and to celebrate he took Mom on her very first trip to Europe. It was his way of treating them both to something special for all those years of sacrifice. The day they arrived in Paris he seemed particularly eager to visit the Eiffel Tower, which was fine with her because that was something she’d dreamed of doing all her life. 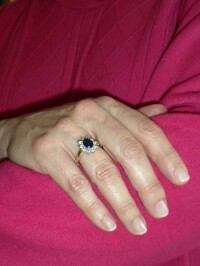 Looking at this photograph today, you probably just see a ring on a middle-aged hand, but I see so much more. I see Paris at twilight and my own Prince Charming with his arms around me whispering "…so you’ll remember this moment forever”, which of course… I will. And we lived happily ever before and after. The End. Search for Husband articles similar to "With This Ring – I Declare!. Search all articles similar to "With This Ring – I Declare! ".